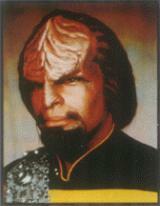 As the only Klingon in Starfleet, Worf has already achieved an illustrious and honorable career aboard the U.S.S. Enterprise as well as played a key role in Empire politics, but he keenly feels the effects of an often tragic life caught uniquely between the two conflicting cultures - immediately evidenced by the traditional Klingon baldrics he wears over his Starfleet uniform. This inner-felt conflict stems in part from his perception of honor as taught but not always practiced by his native people, and is complicated by family relationships which echo his duality of culture in both his personal and public life. Worf has even been put on report. In 2364 he signed aboard Picard's U.S.S. Enterprise in command division as a junior-grade lieutenant, at the time wearing a century-old Klingon baldric. After the death of Security Chief Tasha Yar, he became acting chief and then assumed the post full-time in early 2365, switching to security full-time n the operations division and gaining a promotion to full lieutenant. His shipmates formally promoted him to lieutenant commander six years later with a ceremonial holographic ocean-dunking on an ancient Terran naval vessel. Aside from a few weeks of dating fellow officer Deanna Troi in 2370 on the U.S.S. Enterprise, his most serious romance to date involved the half-human Ambassador K'Ehleyr. Worf had ended their initial affair in 2359, during his Academy years, but K'Ehleyr refused to begin anew and take vows after they mated in 2365 during her mission regarding the T'Ong sleeper ship incident. Worf's family tree took on surprising twists during his U.S.S. Enterprise career, beginning with the trumped-up charge that Mogh had betrayed Khitomer to the Romulans. The resulting probe turned up not only a second survivor and eyewitness to the massacre, his old nursemaid, but a younger brother who'd been left behind on Qo'noS, Kurn. Even when the traitor was proven to be not Mogh but Jared, father of the powerful Duras, Worf later accepted discommendation from Klingon society rather than cause an uproar in Empire politics had the cover-up been revealed. Worf was shocked to discover in 2367 that his interludes with K'Ehleyr had fostered a son, Alexander, when she accompanied the dying Klingon Chancellor K'mpec while old foe Duras, a challenger for succession, was a suspect. With her mate and son present, K'Ehleyr died after being attacked by Duras when she drew too close to the truth about Khitomer, and Worf in anguish killed Duras on his own ship. His captain was more than understanding, as he had been when Worf refused to donate blood to save a Romulan, but he was put on formal report for his actions. During the Klingon Civil War of 2367-68 Worf felt compelled to resign his Starfleet commission to become involved, but it was reactivated after the war. During that time he persuaded Kurn to support Gowron against Duras' sisters and their Romulan backers, standing up to the sisters when abducted and tortured. His aid of the victor Gowron eventually restored his family's honor, and Kurn won a seat on the High Council. Mogh was later rumored to be alive in a secret Romulan prison on Carraya IV, but though Worf's covert 2369 mission found the rumor to indeed be false he did discover - and agree to keep secret - a colony of shamed Klingon survivors from Khitomer, led by his father's old friend, L'Kor, and their Romulans guards who'd resigned to live with them. Worf dipped back into Klingon politics in 2370 after he questioned his own faith in the teaching of Kahless following the Carraya IV incident. His visit to the caves of Boreth, the legendary site of the great warrior's predicted return, was shaken up when Kahless did appear to return. Although later found to be cloned from ancient relics of the original Klingon warrior by the Boreth clerics, the response of spiritually empty Klingons to his presence led Worf to insist that Gowron accept the cloned Kahless as a returned Emperor and moral leader - in effect creating a constitutional theo-monarchy. He was even reunited with his foster brother Nikolai in 2370, when the two clashed again over the human's saving of the doomed Borallan village against Picard's orders and the Prime Directive to save his pregnant mate, a native. The two parted more amicably after the incident, however. After his mother's death Alexander was initially sent to live with the Rozhenkos on Earth, but a year later Helena returned with him to plead that Worf take him back for support and guidance. The two shared a testy relationship at first, but thanks to sessions with the ship's counselor - whom he eventually selected as the boy's foster parent if need be - they fared better. When a shipboard accident left him paralyzed, Worf considered the ritual Hegh'bat suicide until both Riker and Troi talked him out of it, pointing to Alexander's need for a parent; an experimental genotronic spine later restored his health. Shocked in 2370 to find his son returned through a time loop from 40 years in the future, be began allowing Alexander to find his own way - even if it was not the way of a Klingon warrior. During his U.S.S. Enterprise tenure, he birthed Keiko O'Brien's baby in Ten-Forward during a shipwide crisis in 2368, his only prior experience having been a Starfleet emergency first aid class. He dislikes surprise parties and diplomatic duty. He also taught mok'bara classes to those interested aboard ship, won a bat'tleh tournament on Forkas III in 2370, and for a time tutored Doctor Crusher on the weapon; there is no word that he took her offer to join her acting workshop. He trains with a multi-level holo-program of personal combat "calisthenics," has also played Parrises Squares, and picked up the nickname "Iceman" from his U.S.S. Enterprise poker play. Other interests include Klingon novels, love poetry, and a love of Klingon opera. His favorite beverage, christened as a "warrior's drink" when introduced to it by Guinan, is prune juice. Following the destruction of the Enterprise and break-up of its staff in 2371, Worf sent Alexander once again to live with the Rozhenkos on Earth and went on extended leave to revisit the Klingon monastery and clerics of Boreth in search of a spiritual answer to the letdown the rapid events provoked. He found their discussions enlightening and considered resigning his Starfleet commission, but in early 2372 he accepted Captain Benjamin Sisko's request to join the Deep Space Nine staff in light of renewed Klingon friction after dissolution of the Khitomer Accords and their short-lived invasion of the Cardassian Empire. He had all but decided to resign and join a Nyberrite cruiser crew when the Deep Space Nine offer persuaded him to stay, having felt that his Starfleet uniform was a disgrace to his own people. Early on in the assignment Worf admitted to continued bouts of depression over the end of what he perceived as glory days on the Enterprise, and countered it somewhat by taking quarters on the station's starship, the U.S.S. Defiant, and finding a kinship with Dax, who trains with the bat'tleh and mek'leth as well. He soon got the chance to meet Klingon legend Kor, but that honor too was ripped away when image gave way to reality as the two fought over the Sword of Kahless relic they found on a quest. Worf's public opposition to Gowron's invasion left him largely unaffected until the Empire attempted to frame him for the so-called slaughter of 141 Klingon civilians amid a skirmish; the hoax was revealed only shortly before he would have been extradited for the crime and faced certain death. However, on Qo'noS his house was once again stripped of its honor and properties, including Kurn's seat on the High Council. His depressed brother showed up on the station asking for his own suicide rite. Only Dax's interruption stopped the ritual Worf was aiding, but after Kurn's unsuccessful death wish as a Bajoran deputy Worf realized his brother had no future and, short of suicide, opted to have his memory wiped and replaced with another Klingon identity, sending him to live with a family friend. Even then he lived with the regret that his actions had been forever tainted by his human-learned values of mercy. It is with regret that I make this entry in the personal file of Lt. Worf, whom I consider a fine officer. However, despite whatever sympathy I have for his personal reasons and the ways of his culture I cannot condone murder by anyone wearing the Starfleet uniform. The officer in question is spared further disciplinary action only due to the circumstances of the location aboard the Klingon vessel Vorn and the not-unexpected indifference of the Klingon Empire to the incident. Barak'karan -- not surprisingly, a traditionalist. He continues to utilize the Holo-programs for recreation, including his combat "calisthenics," commanding the historic Battle of Tong Vey, but has no stomach for zero-G exercises. His posting here has broadened his horizons in at least two ways: he has renewed his study of the Ferengi Rules of Acquisition, and has admitted a healthy respect for native Bajoran beliefs concerning the Prophets based on his own spiritualism. Worf commanded the Defiant in Admiral Hayes' fleet against the second Borg invasion ca. SD 50890, and briefly found himself back with his old colleagues on the new Sovereign-class Enterprise when Picard rescued his crew and fought off the Borg's would-be temporal sabotage. Worf's action in recovering a new Jem'Hadar vessel intact ca. SD 50050 has already been duly noted in the record and decorated.